This is a story of a great American apple; an apple once of great renown and popularity but then lost, abandoned, presumed extinct. It’s also a story of an individual journey in pursuit of ghosts and legends. Ultimately, it’s a search for history lost and an obsession that became a career. Over 32 years ago, my wife, Suzanne, and I, began a quest to create and establish a small farm and orchard operation dedicated to the collection and preservation of American heritage apple trees, commonly referred to as antique and heirloom apples. Our initial goals were multi-faceted. First, educate ourselves about the stories and histories of American apples, their origins and popular uses and strive to gain a better understanding of how this common fruit became such an important and indelible part of American culture. The next logical step was to seek out sources for these historic varieties in order to collect grafting wood so we could propagate trees for planting on our farm. Our ultimate goal: reestablish these classic American icons for future generations to appreciate and enjoy. I had been inspired by the ground-breaking work of Lee and Edith Calhoun of Pittsboro, North Carolina. Together they had spent years traveling throughout the South looking for rare and obscure apples in backyards, abandoned homesteads and family farms. They were immensely successful in their efforts, generating much well-deserved publicity for their travel and labor. Their years of dedication resulted in the 1995 publication of Lee’s American classic, Old Southern Apples, now recognized as one of the finest journals of American horticulture ever written. It was the early 90’s and Lee’s name seemed to be everywhere – TV, radio, newspaper and magazine articles and public speaking presentations. The more I read and heard, the greater my interest in wanting to learn more about this man and his work as an apple “hunter”. As it so happened, my wife and I were living in southwest Wake County, a mere 25 miles from Lee’s home in Pittsboro. My determination to meet Lee was not to be denied, so one afternoon I took a bold, if not presumptuous step, and called the Calhoun household, spoke with Lee and “invited” myself to his home. Lee must have had some sense of my passion and kindly provided directions to their place. Knowing we would be “talking apples” on this visit, I brought along a bag of various wild apples I had collected from our mountain property in Ashe County we had purchased a few years before. Lee and Edith were extraordinarily sweet and kind and welcomed me, a stranger, into their beautiful home. We spent a very pleasant afternoon enjoying hot coffee and warm conversation as we looked through my sack of apples and talked about their years of work collecting and propagating apple trees. We walked through their small backyard orchard and later Lee showed me parts of his hand-written manuscript that would eventually become Old Southern Apples. As I was preparing to leave and we were saying goodbyes, Lee gave me a sheet of paper. “This is a list of old mountain apples you might find interesting since you already own some mountain property”, he said. I glanced at the extensive list, thanked them both profusely for their kindness and generosity, got into my car and left. Like a foggy wisp of a distant faded dream, the name kept popping up in my mind over the next few days, nagging me with its insistence. I wanted to know more about this apple with the strange, alluring name. What kind of apple was it? Where did such an unusual name come from originally? Why was it listed as “Missing”? My growing fascination with American heritage apples had been greatly enhanced by my visit with Lee and Edith and I was eager to learn more. I began reading everything I could find on the subject and found numerous documents and references that might provide additional valuable information. One of the more intriguing reference items I found was a two-volume book set titled, Apples of New York by S.A. Beach. Published in 1905, the books described the histories and origins of several hundred varieties of old apples from across the country. From a list of antique book sellers I had, I found one company specializing in old horticultural books. I sent a letter requesting a listing of their offerings and, a few weeks later, received a copy of their catalog. Much to my delight, they had copies of Apples of New York available for purchase for a healthy price of $150. I quickly submitted an order for the books. After an interminably long three-week wait, I came home from work one evening and found my package had been delivered. The books were in excellent condition and contained an enormous treasure trove of historical information. Volume two contained a glossary of all the apples described in the two books. “Was Kittageskee included in the listings?”, I wondered. Much to my absolute surprise and delight, Kittageskee was described in volume one on page 178. Turning to the page I read, “Fruit too small to be valuable for general market purposes, but its quality is excellent…desirable for dessert use…vigorous, very prolific and almost free from blight.” Under the Historical column it stated, ”Probably originated with the Cherokee Indians in Western North Carolina.” That was it; Kittageskee was now my obsession and my goal was to find a Kittageskee tree somewhere, anywhere, collect cuttings for grafting and plant trees on our mountain farm. For the next 20 years, my hope and desire for finding Kittageskee remained unabated and unfulfilled. Knowing apple trees could live for 100 years or longer, I held on to the possibility that a lone, abandoned tree might still exist and, if I remained patient and asked enough people, I might get lucky and find one. At every lecture and public speaking event I gave, I always mentioned Kittageskee in the hope I would see somebody’s face light up or a raised hand in the audience. Sadly, as always, nothing ever happened. The years passed. In the meantime, our apple tree business flourished and our collection of heritage varieties now numbered in the hundreds. My hopes of finding Kittageskee began to fade and I slowly, reluctantly, started to accept the reality that Kittageskee was, indeed, extinct. I could accept this. After all, Kittageskee would be one of many hundreds of old American apples, all just as unique and precious in their own way and all just as extinct, all lost forever. Sometimes, though, miracles do happen. 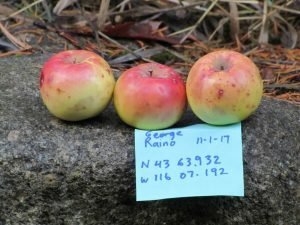 David Benscoter is an avid apple hunter/collector from Washington who has gained national recognition for his work in finding and identifying numerous apple varieties once considered missing or extinct. Dubbed the “Apple Detective”, David has worked closely with the Temperate Orchard Conservancy of Molalla, Oregon and, together, have made some truly astonishing finds. Classic American apples such as McAfee, Shackleford, Fall Jeneting, Saxon Priest and Ewalt have been located and positively identified through their dedicated efforts. We had been communicating with David for two years and had been fortunate enough to receive grafting wood from several of his recent discoveries. On February 23rd, 2018, I received an email from David with the following opening lines: “I have some news I hope will make you smile. We are confident we have found Kittageskee.” Those two words – “…found Kittageskee” – leapt off the screen with an emotional impact that startled me! Never in my lifetime did I expect this obscure American apple would be found. It was difficult containing my excitement! After all, it was this particular old apple that had captured my imagination so many years ago and forever altered the course of my life. Everything that defined my work and goals as an orchardist began the day Lee Calhoun gave me that list of old mountain apples where Kittageskee was listed under the heading, Apples Which Are Missing. There’s a lovely, if not profound, symmetry to this great discovery that denotes a very special moment in my life. As I stated at the beginning of this essay, 32 years ago my wife and I took the first confident steps together on a great, lifelong journey in search of ghosts and legends. Our long trek comes to a close next year as we finally put away our grafting tools and contemplate retirement. Is it not appropriate that the apple that started and defined this great adventure is now finally in-hand as our journey draws to a close? The cycle is complete; the circle closes. I am satisfied.